A while back I found an old grain sack at my favorite store. I've been thinking about what to do with it for a while now. Well, I think I finally had a good idea. I re-decorated the entry with stuff I had stuffed in my treasure closet. It's always like Christmas digging through the closet and finding things I haven't seen in years. It needed a little fixing and I got it for a steal. Stuffed some grapevine ball string lights in it, cuz I just love twinkle lights....what can I say? They just hop into my shopping cart. 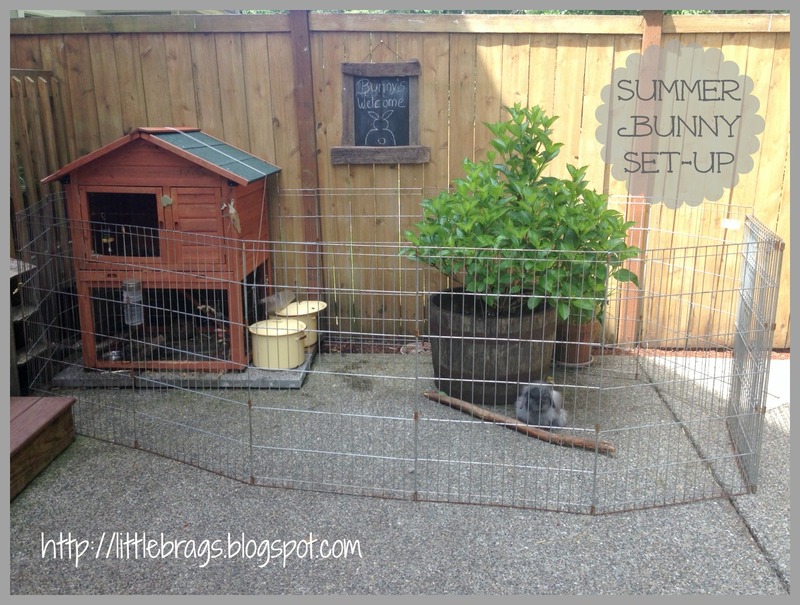 Speaking of HOPPING, I also wanted to share our Bunnies "Summer Set-Up" because I wanted to add some cuteness to this post. That is it for this weekend Peeps....For those of you that are following me through email, I had technical problems and my 2 last posts have not been send to you. Here are the links, so you can catch up. 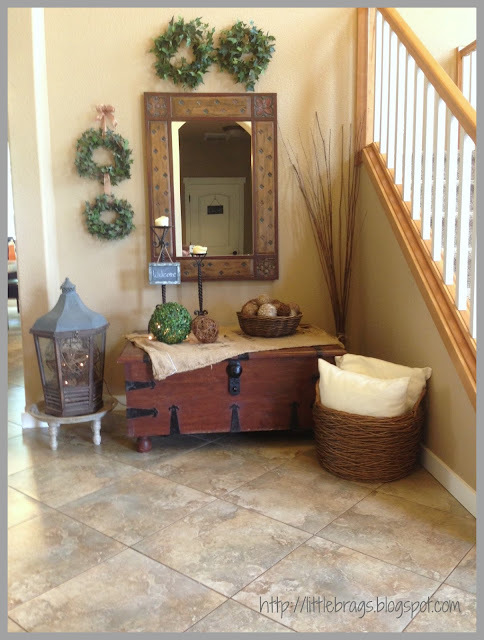 Love your entry way vignette. 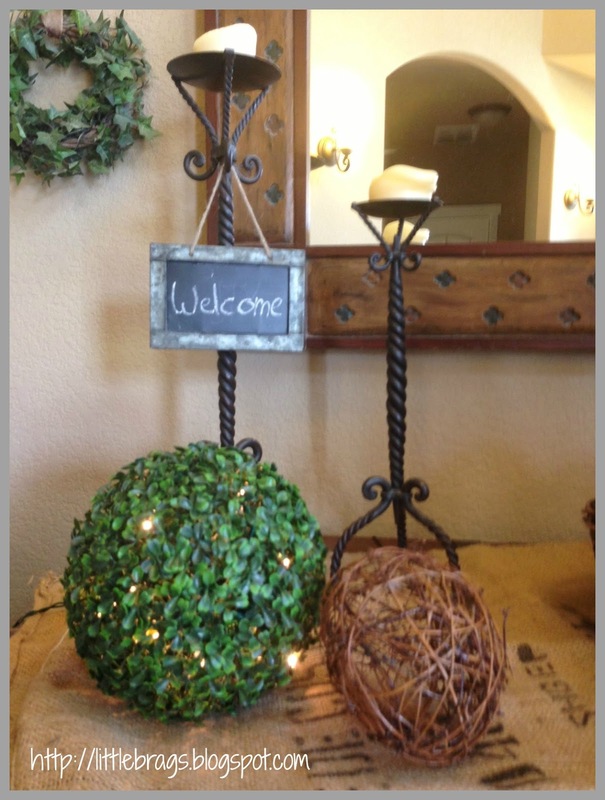 I really like the welcome sign that you hung from one of the candle holders. The green wreaths are fabulous. They really add a fresh punch of green. 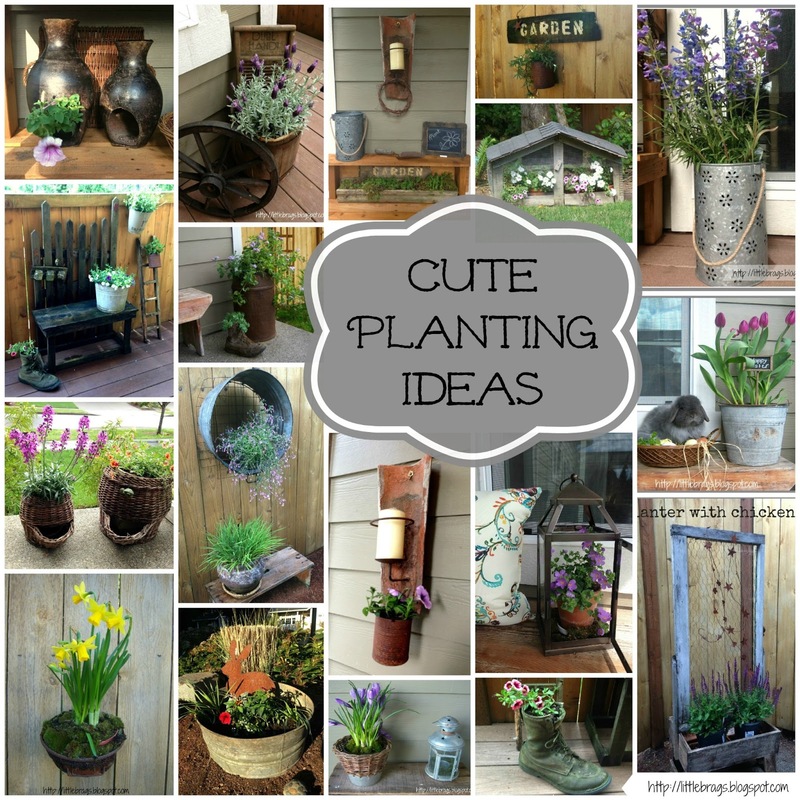 I think I saw your potting bench featured over at it's overflowing? Congrats!! You bunny is sooooo cute. I love the picture of it in the pot. LOL. Love that grain sack! That's a great way to use it too. Love the lantern you found too. The shape of it is nice. It goes without saying how much I adore your bunny! The pen you set up for him is so nice. I bet he likes it. I bet your bunny is one happy camper now! What a neat set up for him. I really like your grain sack too. 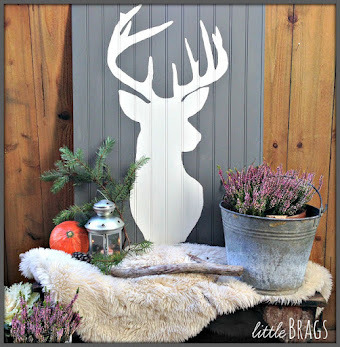 Great little vignette! Lisa, thanks so much for the sweet comment!! Hey Christine! 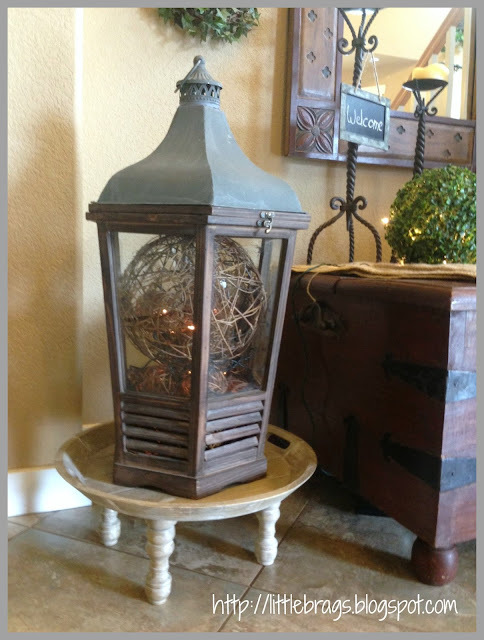 I love that huge lantern you have and also how you have it on a cute little stool or plant stand. Baskets with decor balls are my favorite too and everything looks great. I love that bunny!!! How come I never find old grain sacks when I am out scouting for deals!! 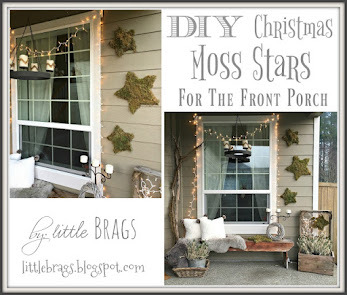 It works so well in your vignette! Thank you for sharing at One More..http://www.onemoretimeevents.com/2013/06/share-it-one-more-time-features-and_29.html Love your grain sacks... and your bunny what a great set up. I love this! 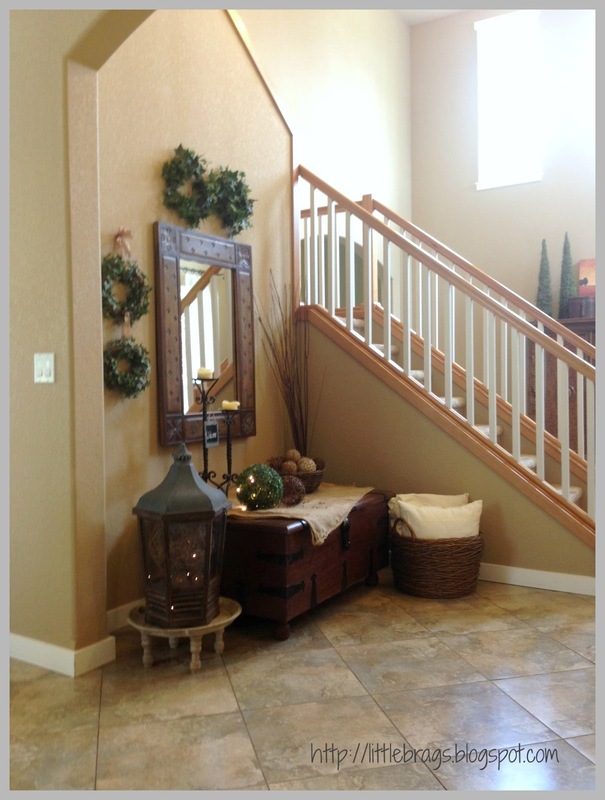 Your foyer is beautiful! Hi Lisa, I just visited and linked up..thanks for inviting me. Love all the details in your entry way and how you used all the natural garden elements very fitting for this time of year! Chernee, thanks o much for the visit and sweet comment!!! I'm a sucker for twinkle lights, too. I love how you used them here, along with all your other hallway treasures. It's amazing how one new (old) item can inspire a new design. I also love your bunny's home, including his chalkboard. Thank you Jill for the sweet comment! 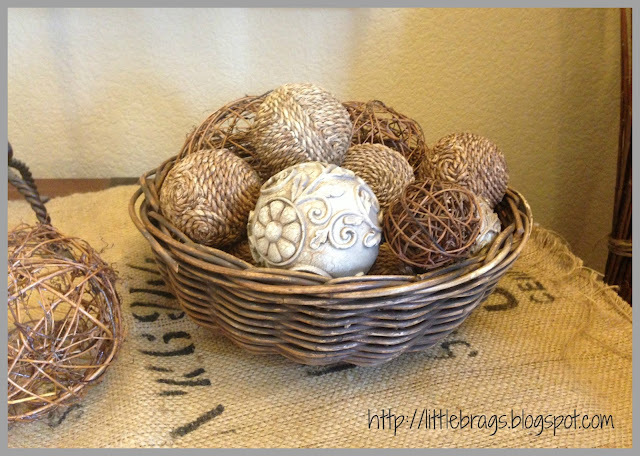 That is a very pretty vignette you have created in your foyer. Love the textures in all the different pieces including the grain sack. Love the whole thing (and, of course, the grain sack!). Lovely. 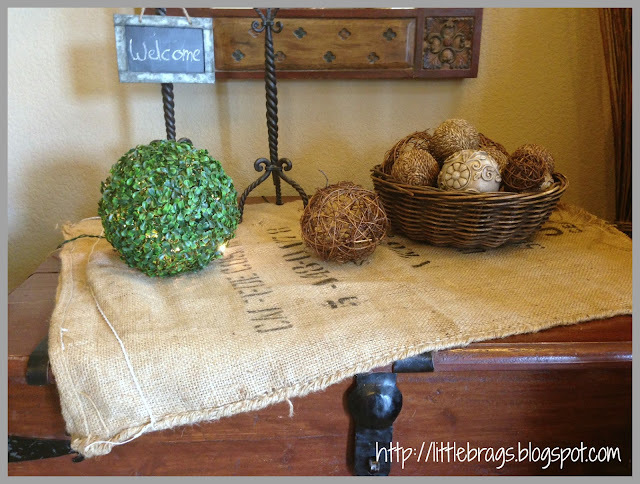 I love how you used your burlap sack! thanks for linking up with Hickory Trail! Thank you for linking at Tuesdays with a Twist! Love the grain-sack and the lantern with the lights....so welcoming! Your bunny is a cutie!! 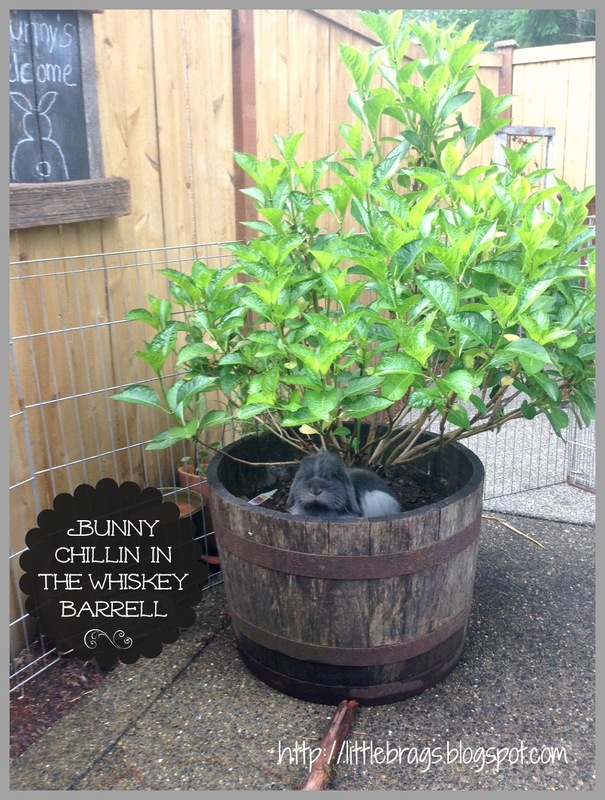 Christine, love your use of the grain-sack and the bunny in the whiskey barrel just made my morning! :) Your little bunny sign is also absolutely adorable! Thank you so much for sharing and joining us at Best of the Weekend - pinning to our party board. Have a wonderful weekend and hope to see you next week! What a lovely grain sack you found!!! And your bunnies are adorable! 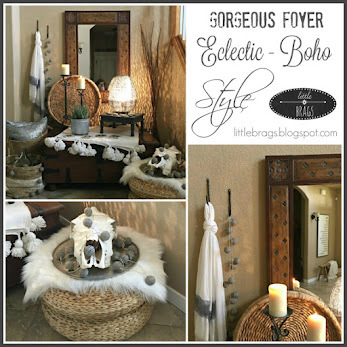 Great vignette! It all looks fab together. The trunk and lantern are divine. Also love the photo of your bunny in the barrel- too cute! 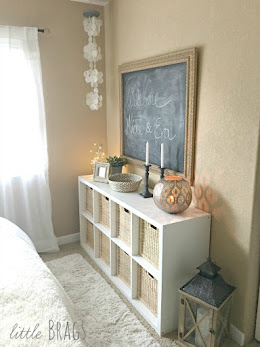 Such a sweet vignette! 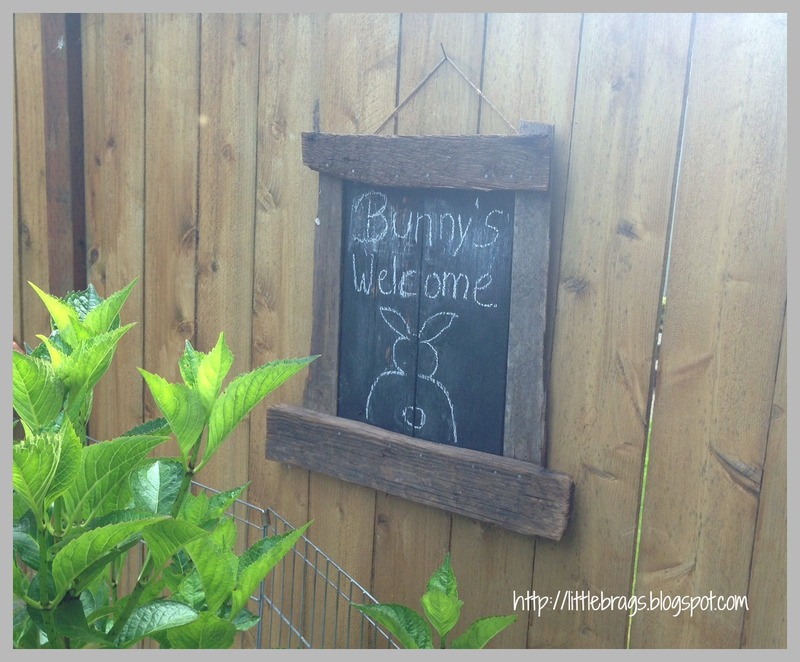 Your bunny has the perfect set-up...sooo cute! You are welcome...glad you invited me! I love your grain sack decorating. I will be featuring this tonight at my Sizzle into Summer party that opens at 8pm EST. Please stop by and pick up an I've Been Featured button. What a cool idea - it looks great. What a lovely vignette. I love the grain sack the balls with twinkle lights. The lantern is great too! Thank you for sharing it at What We Accomplished Wednesdays. Have a great week! I love grain sacks! I've made table runners out of some, too! 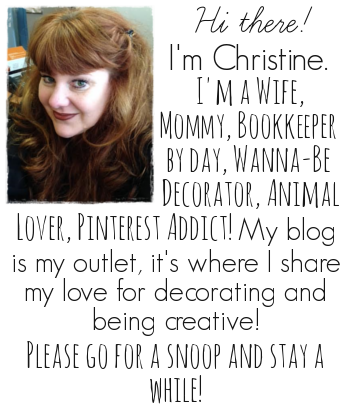 I'm following you on blog lovin'! Very cute idea! I also love grain sacks. 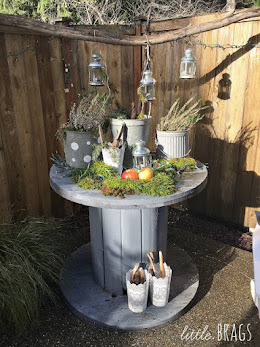 Thank you for linking up at our Simply Create Link Party! Very Cute! !And I had to look twice if that was a real bunny in that planter barrel! LOL Thanks for sharing on DIY Showcase Party!! Shelly, what is your blog address??? Beautiful! I love your sense of style! I need to find me a grain sack!!! 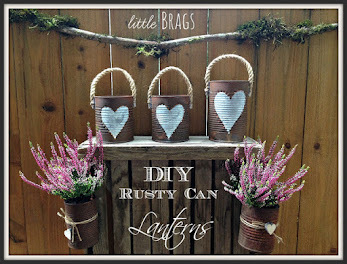 I would love for you to come link up to my first "Clever, Crafty & Creative Linky Party #1"
You have a beautiful entry! I just love your bunny! Thank you for joining Home Sweet Home! 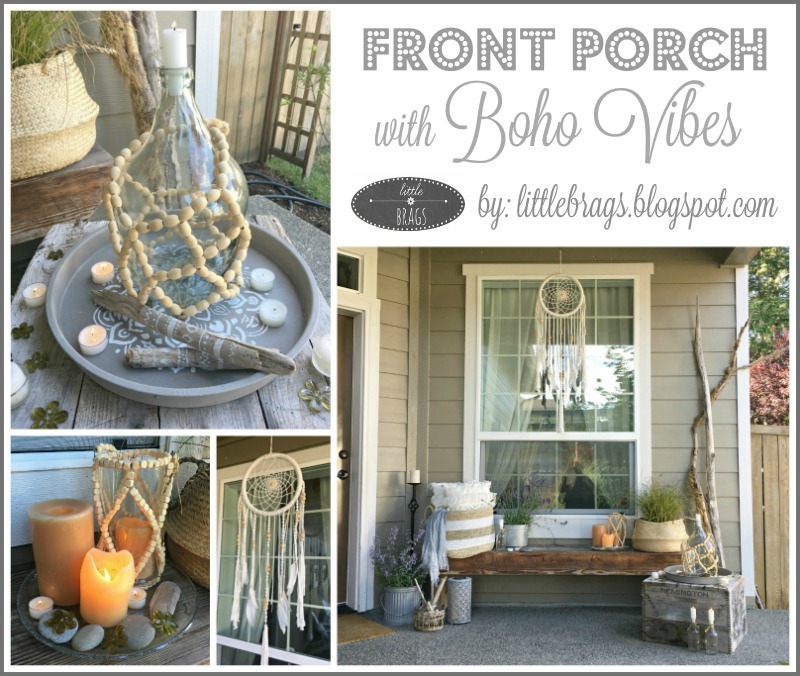 Love your front entry!!! 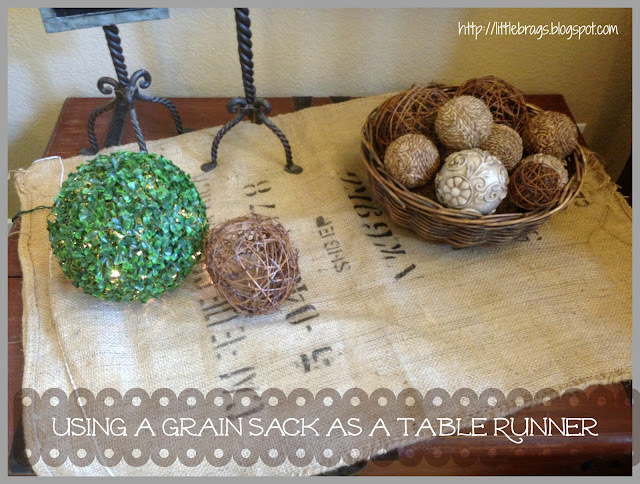 And you have some great ideas on using grain sack for decorating! Thanks for sharing this with us at our Summer Spruce-up link party! Following you on GFC, facebook and gogle +! Thanks so much for all the comment LOVE !!!!!! 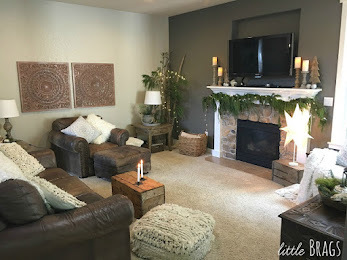 Hi Angela, glad you like my entry and thanks for the sweet comments today....The wall color is called FILBERT and the Company is Devine Colors. You can order a sample on line and have the color matched at any paint store. My kitchen and nook have chocolate color paint as well. The Filbert goes super good with the chocoloate.....you can click on my HOME TOUR tab and see pics.....Thanks again for the comment love! 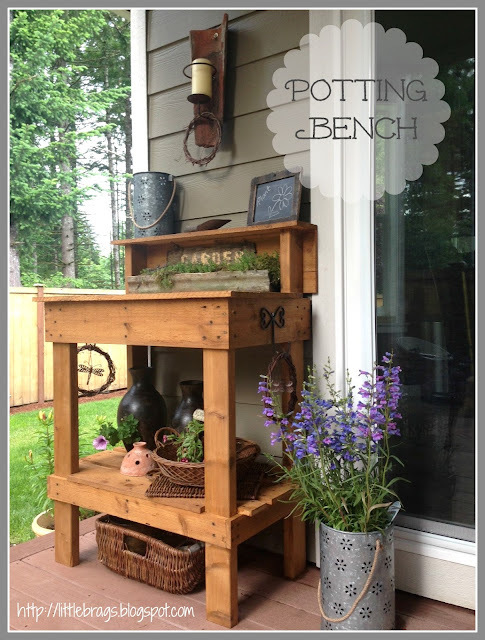 So in love with the potting bench! The bunny is pretty cute too :-). Great photos. 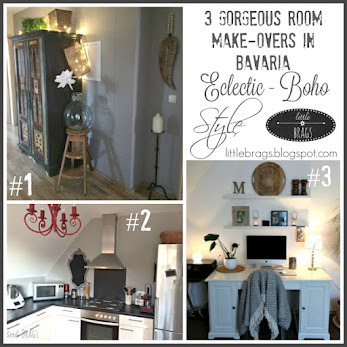 Thanks for sharing at my Weekend Beautiful Blog Party. 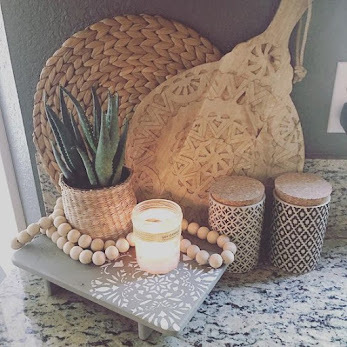 Such a pretty vignette Christine! Love it... The grain sack has such texture and interest!